Illustrated Map of London or Strangers' Guide to the Public Buildings, Theatres, Music Halls and all Places of Interest. MOGG'S NEW LONDON GUIDE, 1849. The Coloured lines exhibit the Omnibus routes. This is the second edition of a map of London first published in 'Leigh's New Picture of London'. The title appears along the top with a scale bar at the top right. The map is divided into half-mile squares with letters along the top borders for reference. It also shows Southwark Bridge and the proposed New North Road across Finsbury Fields. Hall, S.
The title of this map appears in a panel above the plan, with a scale bar inset in the bottom border. The map extends westward to include Chelsea Beach and shows the proposed tunnel under the Thames at Wapping. The Greenwich-to-London railway line also features. Under construction at the time of this survey, the line reached Bermondsey from Greenwich in 1836. Ten months later the line reached London Bridge, making it the first railway terminus in the capital. 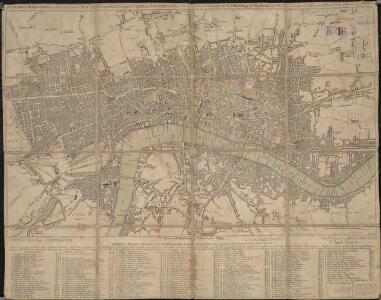 PLAN of the Cities of LONDON and WESTMINSTER the Borough of SOUTHWARK and PARTS adjoining Shewing every HOUSE. By R. Horwood. This small map possibly derives from a German work published in Nuremberg.